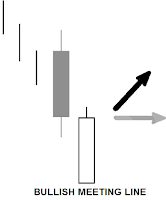 Candlestick reversal pattern is a candlestick chart pattern that indicates the imminent reversal of the price or direction of the trend which is very suitable as a moment of trading position. The candle pattern that appears on the trading chart can also be used as an accurate pattern indicator in taking trading positions. 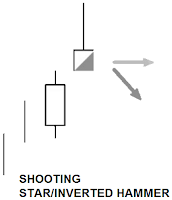 We also have to know the types of candles and their meaning so that in doing candlestick analysis it is more accurate. 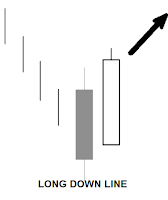 When uptrend appears a candle with a relatively short body and an upper shadow that is longer than the body. The candle can be either bullish or bearish candle. When the market is experiencing an uptrend, the price is opened above the previous day's closing price so that there is a gap up and indicates that the trend will continue. But after being able to rise, the price finally closed near the opening price. This indicates a change in market sentiment from bullish to bearish. · Confirmation is needed to give a sign of reversal. The next session must be opened and moved down. 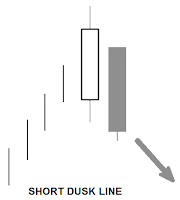 When downtrend appears a candle with a relatively short body and a lower shadow that is longer than the body. The candle can be either bullish or bearish candle. When the market is experiencing a downtrend, prices are opened below the previous day's closing price so that a gap down occurs and indicates that the trend will continue. But after the turn, the price finally closed near the opening price. This indicates a change in market sentiment from bearish to bullish. · Confirmation is needed to give a sign of reversal. The next session must be opened and moved up. 1. Bullish candle with a long body appears during an uptrend. 2. The next session opens lower, which is above the middle of the first candle body and closes lower below the first candle. When the market is experiencing an uptrend then when the opening price opens lower which is in the opposite direction with the current trend is a strong indication of a change in sentiment from bullish to bearish. This is supported by closing below the first candle so that the seller starts taking control. 2. The next candle had a gap up above the previous session's high but finally the price closed down near the previous session's closing price. When the market is experiencing an uptrend, the next session opens with a gap up indicating market participants still think conditions will remain bullish. But apparently the price reversed and closed again close to the previous session's closing price. This indicates that market participants are not sure the uptrend will continue and they begin to think the market will be bearish. · The body of the two candles must be the same or almost the same. · The longer the body of the candle the stronger the change in sentiment that occurs. 1. Bearish candle appears during an uptrend. 2. The next candle was a gap down below the previous low session but finally the price closed up near the previous session's closing price. When the market is experiencing a downtrend, the next session opens with a gap down indicating market participants still think conditions will remain bearish. But apparently the price reversed and closed again close to the previous session's closing price. This indicates market participants are not sure the downtrend will continue and they begin to think the market will be bullish. 2. The next candle is a bearish candle and is within the range of the first candle to form inside day and bearish harami. When the market is experiencing an uptrend, after the bullish candle occurs inside day which indicates doubts among market participants whether the uptrend will continue. The next session was a gap down and closed below the first low candle which showed a change in sentiment and a change in control from buyers to sellers. 1. 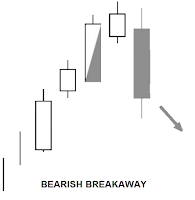 Bearish candle appears during downtrend. 2. The next candle is a bullish candle and is within the range of the first candle to form inside day and bullish harami. 3. The next candle occurs a gap up with the second candle and finally closes above the first high candle. When the market is experiencing a downtrend, after the bearish candle occurs inside day which indicates doubts among market participants whether the downtrend will continue. The next session was a gap up and closed in the first high high candle which showed a change in sentiment and a change in control from seller to buyer. 1. 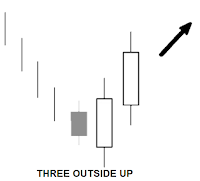 Bullish candle with a small body appears during an uptrend. 2. The next candle has a gap up but it is finally closed below the first candle, resulting in an outside day and bearish engulfing pattern. 3. 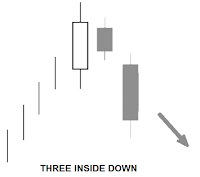 The next candle is opened near the second close candle and moves down to produce a bearish candle. When the market is experiencing an uptrend, candles with small bodies indicate the market is beginning to lose momentum. 1. 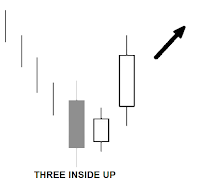 Bearish candle with a small body appears during an uptrend. 2. The next candle has a gap down but it is finally closed above the first candle, resulting in an outside day and a bullish engulfing pattern. 3. The next candle is opened near the second close candle and moves up to produce a bullish candle. When the market is experiencing a downtrend, candles with small bodies indicate the market is beginning to lose momentum. Next an engulfing pattern occurs giving an indication of reversal and changes in sentiment. 1. The first candle is a bullish candle that occurs during an uptrend. 3. 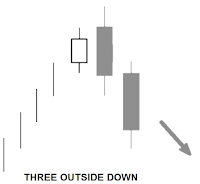 The third candle can be a bullish candle or bearish candle with a body that is longer than the second candle. 4. The fourth candle is a bullish candle with a shorter body and high that is not far from the previous candle. 5. The fifth candle of the price opens below the close of the previous session and closes at or close to the second candle gap. This pattern shows a market failure to maintain trend momentum. The gap up that occurs provides information that the buyer still controls. But when prices are unable to rise further and a quick retracement occurs to close the gap, it indicates a strong change in sentiment among market participants. 1. 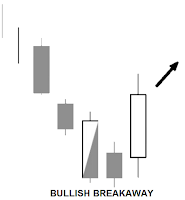 The first candle is a bearish candle that occurs during a downtrend. 4. The fourth candle in the form of a bearish candle with a shorter body and a low which is not far from the previous candle. 5. The fifth candle of the price opens above the close of the previous session and closes at or close to the second candle gap. This pattern shows a market failure to maintain trend momentum. The resulting gap down provides information that the seller still controls. But when prices cannot go down further and a quick retracement occurs to close the gap, it indicates a strong change in sentiment among market participants. 0 Response to "The Most Accurate Reversal Candlestick Pattern in Binary Forex Trading Iq Options"